Built from Kakadu's 12 oz canvas fabric which is perfect for bad weather protection, the Delta Vest has a multitude of pockets so you can keep your hands free when you're on the move. It sports 16 pockets which includes 9 front patch pockets, 2 front zip storage pockets, 2 side entry welt pockets, 2 internal security pockets and the back game pocket. 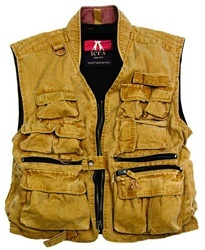 Great utility vest!